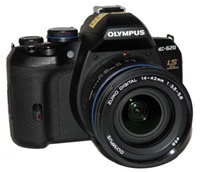 Olymplus has launched its E-620 digital SLR camera to replace the mid-grade E-520. The smaller DSLR camera is built-in with image stabilization and is featured with TruePic III+ image engine of the E-30 that able to automatically enhances important aspects of image. Featured with 2.7-inch swivel LCD, Olymplus E-620 is also featured with 12-megapixel live MOS sensor with a custom 7-point auto-focus function and able to capture 4 frames per second. It also boasts a Supersonic Wave Filter dust protection to eliminate the potential dust from damaging the photos and, offers the same Art Filters, Multi Exposure mode and five different aspect ratios of the most expensive E-30 model. Art Filters, Multiple Exposure, Wireless Flash, Multi-Aspect. Comfortable Live View thanks to high-speed contrast AF. Free-angle 6.9cm/2.7” HyperCrystal III LCD. Built-in IS with max. 4 EV steps efficiency. 7-point Twin AF (5 cross points). Optical viewfinder with approx 95% field of view and approx 0.96x magnification. The Olymplus E-620 is expected to be available at end of April 2009 and is priced at $699.99 with body only.